Thirty-five-year-old Samantha acts without thinking. Her heart is huge while her sense of purpose is small; she's willing to fight for those she loves, but she's never learned to fight for herself. Eighteen-year-old Melody is cold and calculating, and she's driven by the desire to better herself. As these compelling yet deeply flawed women battle for the affections of twenty-five-year-old Nathan, he becomes increasingly confused and torn between them. Nathan is Melody's English teacher, and after he saves her from being raped, she becomes attached. Melody longs for the affection she's never felt, so she involves people in her self-invented drama, making sure she is at once the star and the director. Meanwhile, Samantha is newly married to Nathan. But Samantha has hang-ups about motherhood and lingering feelings for her ex. To make sense of the world, Sam relates her life to the themes of her favorite movies, while she independently makes a documentary to jump-start her non-existent film career. Stylistically influenced by Jodi Picoult and Jennifer Weiner, Starring in the Movie of my Life is told alternately from both Samantha's and Melody's points-of-view and relates two complete yet combined stories about love, acceptance, and redemption. It speaks to our universal desire to be saved by the ones we love, and the monumental effort required to save ourselves. 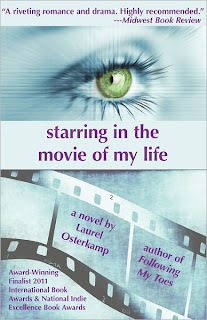 Laurel Osterkamp's first novel, Following My Toes, published by PMI Books, won the 2008 National Indie Book Award for Excellence (Chick Lit category). She drew on her experiences as a high school film studies and creative writing teacher as she wrote Starring in the Movie of my Life. Currently she lives in Minneapolis with her husband, son, and daughter, and is working on her third novel. 1.) When you aren't writing what do you enjoy doing in your "other" life? I actually teach high school English full time, and I also have two children, ages 7 and 2. So that takes up most of my time! I feel like writing is my “other life” because I have to really work hard to reserve the time to do it. I feel lucky though, because being a teacher, mother, and a writer are all very rewarding. Besides that, I enjoy exercise, reading novels, shopping for boots, and watching television while eating ice cream. 2) What or who inspired you to become a writer? I can’t say for sure, but it’s probably the hundreds up hundreds of novels that I’ve read. I started early, and it’s addiction that won’t go away. Sometimes I find myself narrating my life as if I’m a character in a book – I do this for my own benefit, inside my head. So, it only makes sense that the next step would be to write it all down. Even though my writing is fiction, all of my characters resemble some aspect of my own personality. 3) Psychologists tell us what we wanted to be when we were 10 years old is very telling of what our avocation should be. What did you want to be? How has it manifested itself in your life? I wanted to be an actress. I even majored in theater in college. For a while I performed with comedy troupes here in Minneapolis, where I live. In addition, some of the first stuff that I wrote was comedy sketches for my troupes to perform. Before my kids were born I directed the plays at the high school where I work. I also met my husband doing theater. Lately though, the closest connection I have to the theater is watching the Tony Awards every June. 4) Do you have another book in the works? Tell us a little about it, please. Thank you for your time and for the wonderful interview, Laurel! 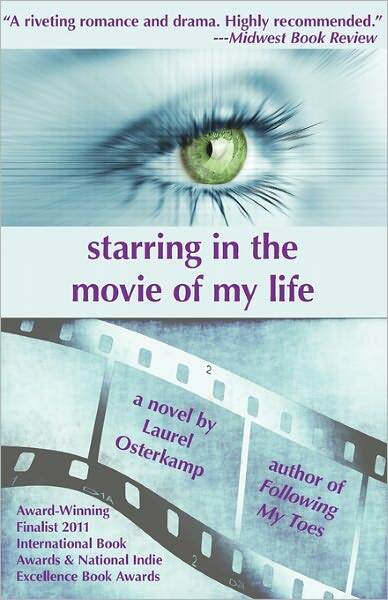 "Starring in the Movie of My Life" is an enchanting and moving novel that will cause you to ask significant questions about yourself and your world views. I think it's well worth picking up on Amazon or Barnes and Noble this summer! I really liked it. I love the cover. This looks like a fantastic read! It was wonderful to meet Laurel Osterkamp.